Pets without an opposing thumb (this would include all cats, dogs, guinea pigs, hamsters, pot bellied pigs, etc.) are physically unable to play with matches. However they can all be like children, active and curious. There are many stories of cats and dogs starting accidental fires. As unbelievable as it is several have to do with a cat or dog actually turning on a stove. Here are some examples of accidental fires started by pets. Pets exploring, playing, or looking for a snack can, and do, start accidental fires. Consider the child-like state of your pet. They depend on you to keep them safe. Fire safety with pets comes down to some very simple basics. Our pets can accidentally tip a candle, heater, lantern, or other source of open flame or heat with ease. Candles are a ready source of fire problems in homes with and without pets. Consider using flameless candles to eliminate this open flame risk. Make sure that heaters, lanterns, and other sources of open flame and heat are secured from being toppled. Newer heaters now come with sensors that turn them off when they are tipped. Consider replacing older heaters without this feature. Pets looking for food are going to end up in the kitchen. Those smells that are on or near the stove tell them that yummy goodness is close if they will exert a little effort. As they try to grab a snack there is a good chance that they will accidentally turn one or more of the burner knobs. The end result can be catastrophic. If a gas burner is turned on but not ignited gas will be released into the home. As it builds it creates a combustible cloud that could not only ignite into a fire, but also explode. If it is not possible to block your pets’ access to the kitchen then cover or remove the stove knobs. Pets will play with or chew on exposed wires, especially when they look like fun. Neatly bundled wires that are tucked away are a lot less fun than wires that are unkempt. As in the last example of accidental fires given it is easy to see how pet accessories like heat lamps can be the source of an accidental fire. Make sure terrariums, cages, and other enclosures are well secured from tipping and falling. Examine the accessories to make sure that they are in good working order and are not in need of replacement. Fires started by pets are an unfortunate fact. 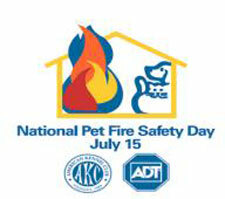 However, if we work to fire proof our homes we can protect ourselves, and our pets from mishaps. If you have a pet with a behavioral problem that may pose a risk (i.e. chewing, getting up on things like appliances, etc.) contact your veterinarian to get help. In the Salem, Oregon area Rolling Vet specializes in pet behavioral issues. Being mobile means that they can help you evaluate not only your pet but the environment as well. You can reach Rolling Vet through their website at: www.rollingvet.com, via or ‘Contact Us‘ page or on the phone at (503)400-7992.